Since acquiring a molcajete (traditional Mexican mortar & pestle), it’s hard NOT to make guacamole every day. When you buying as many avocados as I do, remember to wait until they’re just about ripe and store them in the refrigerator – they’ll last for 1 to 2 weeks longer. Refrigerating avocados slows the ripening process without altering the flavor or texture. If you don’t finish the whole avocado, wrap it tight in plastic wrap and put it back in the fridge. Now you can buy your avocados days ahead of time without fear of them melting into a green-brown ooze. Use them liberally, don’t be shy – avocados are great on salads, sandwiches, on top of soup, chili or tacos. Don’t forget, you could always bake an egg into the avocado or make some Avocado Ice Cream. Of course there’s always my perfected guacamole recipe, best served on tacos, burgers or with Homemade Tortilla Chips. 1. Add the jalapeno pepper, cilantro, lime juice, red onion (if using) and salt to the molcajete and mash it with the tejolote (stone pestle). If you don’t have a molcajete, use a medium bowl and the back of a fork. Slice the avocados in half, remove the pit and use a large spoon to scoop them out and into the molcajete. Mash and mix well with the tejolote, adjusting the salt to taste. Serve on tacos and with tortilla chips. Store in the refrigerator for 2-3 days. I almost thought you were going to put PB in this recipe…phew! 1.) Guacamole is my crack. Homemade guacamole is the way to go. I despise the store-bough variety, why is it so bitter?! And what crazy chemicals do they put in it so it doesn’t brown? It’s really an unnecessary purchase when you can make it so easily, tastier and healthier at home. I had a 5 de Mayo BBQ this weekend with all my Mexican friends. It was so much fun to taste authentic Mexican food and all their traditions for this holiday. Of course, to my ignorant eye, all the dishes were permutations of tacos! But all delicious! Nick you are the bestest! PB & chocolate are my main sources of fat & happiness too!! What a great opening line. I never buy store bought guac, I mean what the heck is in there right? When it’s really hot outside, a cold dish of homemade guac & chips and ice cold beer is our meal of choice. This post has the best opening line EVER! I love it! The world would be a sad, sad place without chocolate and peanut butter. But guacamole ain’t bad either ;-) Happy Cinco de Mayo, Nick! Just had some guac yesterday, it was SO good! Yum to yours! running out of PB ideas, or are you going to surprise us with a mega one? This quac is my happiness right now! Happy Cinco de Mayo! If I was on a desert island and I could have any three items I wanted: Peanut Butter, Avocado, Chocolate Ice Cream (gotta get my calcium, I’m a women!). Happy Cinco de Mayo! I like to tame spicy food with a kiss of pb, but that’s just me….i dont think i have ever even bought guac from the store, whats the point? I LOVE GUAC!!!! I would eat it all day every day if I could. I love avocados and put them on as many things as possible. I believe I was an old Mexican lady in my past life. I make guacamole allll the time, to the disgust of my boyfriend. He despises guac. I don’t understand it. He may have to go. J/K. This is pretty much how I make it, but I use very little cilantro. I don’t much care for it…which also makes me question the validity of my past life statement…. This sounds wonderfully fresh, Happy Cinco de Mayo! This is how I make my guac, too–but without the salsa. Try it. I think you’ll love it. i hope you have some of this for tomorrow! Nick, I must agree. Guacamole, the homemade variety, wins my heart. I finally made it to PB & Co today, very interesting. I think the flavors of the peanut butter (at least some of them) are a little too strident when consumed alone, but I now have a bunch of little containers waiting to undergo the sandwich test. I’ll report back later . . . Happy Cinco de Mayo, Peanut Butter Boy! I just made homemade guac for the first time a few months ago. I always thought it would be so complicated, but its not! So much cheaper than buying it premade! MMmm, guac :) i’m toy-ing with the idea of throwing in some edamame next time i make it! Of course, you gotta have the works! 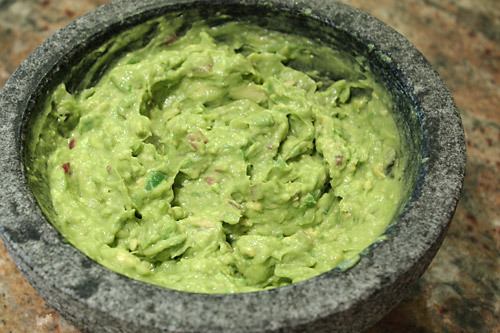 I’m eating guac I made today for Mother’s Day as I type this…one of my absolute fave things to munch on! i like yours just plain and simple! i add all kinds of goodies to mine! (cumin, garlic, red onion, and sometimes pineapple). I always mean to experiment more with what I add but then I shy away because it’s so good plain like this. It depends what you’re going for though. If you’re putting it on tacos or in a burrito, the guac should have more flavor so you can actually taste it! It’s a work in progress, I hope to come up with a good recipe for pb guac eventually. I’ve been using the fridge trick forever. My secret gaucamole ingredient it just a couple tablespoons of greek yogurt! Oooh, that sounds really good. Thanks Chuck, I’m tryin that next time!